Get in a total body, cardio workout while having fun playing tennis! Great for all skill levels. Builds on the rallying skills kids develop in Tennis Afterschool Zone and Summer Tennis Camp and introduces them to match play. Learning tennis in Portland, Oregon has never been easier than with our Portland tennis lessons, summer camps and after school programs. Choose from a variety of options for youth, teens, and adults of all ages. 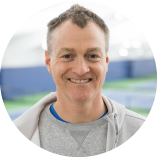 Whether you are a newbie or an advanced player that is more interested in tennis for fun than the competitive circuit, tennis in Portland from RecTennis gives you plenty of options. "It's always exciting to be around tennis! Tennis is incredibly unique as it creates a multitude of life-long learning activities fostering a wide range of skills. Students can't help but build greater athleticism and confidence!" Contact Emory for information for: Grant Park, Penninsula Park, and Argay Park. Contact Mary Jo for information for: Gabriel Park, Mt. Tabor Park, Portland Heights Park, and Sellwood Park. Here at RecTennis we celebrate the values and ideas other than winning a match. We focus on the minds of kindness and joyfulness. The purpose of RecTennis spotlight is to shine a light on players who fit these values, not always the ones who are amazing at playing tennis, but the ones who are amazing at having fun! We are always adding programs. Please check back for more Portland tennis lessons, after school programs and summer camps! What is Tennis Afterschool Zone?